D Sanjekar, C Shekhar, H Stevens, N Mussadi. Failure Mode Effect Analysis of Patient Controlled Epidural Analgesia. The Internet Journal of Anesthesiology. 2018 Volume 37 Number 1. Objectives To increase patient safety by focusing on most vulnerable steps in the process flow implimented for PCEA, thereby applying proper corrective measures so as to avoid near misses,critical incidents and sentinel events. Results We found that that with efficient and timely application of corrective measuresthe RPN score can be reduced drastically resulting in more patient safety and stisfaction. - PURPOSE: To assure the safe and effective use of patient controlled epidural analgesia (PCEA) for the epidural administration of opioids and local anesthetics. - POLICY: PCEA will be used for the treatment of patients in moderate to severe pain during labour. Only the patient can push the PCA button. A patient must be able to physically push the PCA button, no nurse, family member, or healthcare provider is authorized to push the patient’s button (no PCEA by proxy) at any time. If a patient requires supplemental doses to achieve analgesia, the doctor will administer the dose through the pump as ordered. - Anaesthesiologist as a PCEA provider will approve initiation of PECA and order PCEA using the electronic infuser set.Only provider can amend the PCEA settings if necessary depending on pain score and patient satisfaction. Anaesthesiologist will assess the patient as and when felt necessary. - Nursing will instruct each patient selected for PCEA on the correct method of use, how pain will be assessed, and monitoring expectations. Upon initiation of PCEA and in timely manner nursing will assess and document BP, pulse, RR, pain score, sedation score plus an assessment of motor/sensory function. 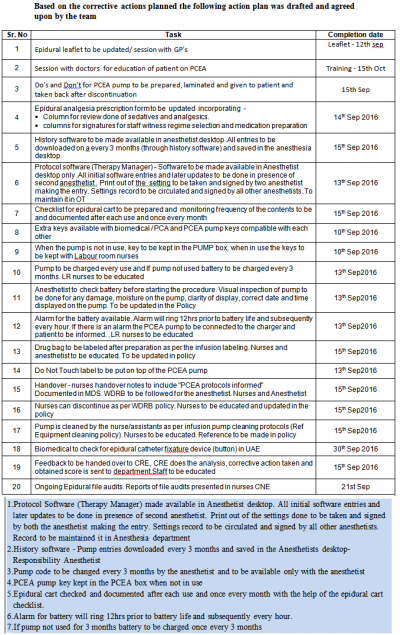 Implications Meticulous following of post FMEA process flow of PCEA which was alredy proven and time tested; has resulted in to considerable reduction in near miss events and improvement in patient satisfaction levels.Corrective measures were included into policies and processes of the hospital. FMEA is acronym used for Failure Mode Effect Analysis. Failure Modes and Effects Analysis (FMEA) is a systematic, proactive method for evaluating a process to identify where and how it might fail, and to assess the relative impact of different failures in order to identify the parts of the process that are most in need of change. - A group brainstorming tool which identifies and prioritizes potential failures in high risk process. - Quality improvement tool – but unlike many tools it does not require complicated statistics. Patient-controlled Epidural analgesia (PCEA) is a method of allowing a person in pain to control their own pain. Patient-controlled epidural analgesia has proven to be both safe and effective. PCEA has many advantages when compared with continuous epidural infusion (CEI) techniques. Although the analgesia provided is similar, PCEA reduces the incidence of unscheduled clinician interventions and the total dose of local anesthetic. PCEA also reduces the incidence of lower extremity motor block. It is a corner stone to pain management. PCEA is can be used for Labour, post-surgical and medical acute pain management. Continuous monitoring is vital in ensuring patient safety and care. - Reason for selecting this topic is Introducing “Patient Controlled Epidural Analgesia” as a new service to the facility. - Potential Patient harms if safety measures not adequately implemented. Patient-controlled Epidural analgesia (PCEA) is a method of allowing a person in pain to control their own pain. Patient-controlled epidural analgesia has proven to be both safe and effective. PCEA has many advantages when compared with continuous epidural infusion (CEI) techniques. Although the analgesia provided is similar, PCEA reduces the incidence of unscheduled clinician interventions and the total dose of local anesthetic. PCEA also reduces the incidence of lower extremity motor block. It is a corner stone to pain management. PCEA is can be used for Labor, post-surgical and medical acute pain management. Continuous monitoring is vital in ensuring patient safety and care. 10. Calculate the resulting RPN as the failure modes are reduced or eliminated. Step 1: Review the Process: Construct a detailed flow chart of the process. - Learn the flow chart process and symbols. Step 2: Brainstorm the Potential Failures: Determine each step that can “fail” and how it can “fail”. Step 3: List Potential Effects of Each Failure Mode: Determine the “effect” of each possible “failure”. Steps 4, 5, 6, 7: Determining how serious the possible effect(s) could be on the patient – “criticality”. - Find the Criticality Index (CI) or Risk Priority Number (RPN) - Compute criticality index (CI) or Risk Priority Number. CI is the product of three indexes or Occurrence Rank X Severity Rank X Detection Rank. Step 8: Prioritize the failure modes for each action. - Decrease likelihood of occurrence. - Decrease the severity of effects. - Increase the probability of detection. Step 10: Calculate the resulting RPN as the failure modes are reduced or eliminated. [Start Date – 23rd June 2016 End date – 17th Sep 2016]. Introducing “Patient Controlled Epidural Analgesia” as a new service to the facility. 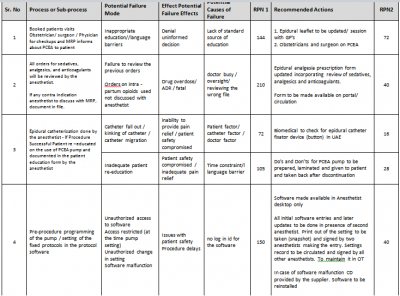 Potential Patient harms if safety measures not adequately implemented. - Regime selected cross checked by the nurse. - Medication preparation - witnessed by second staff. - Labeling of prepared medication. - Pump alarms – medication level and battery. - Do’s and Don’ts leaflet. - Availability of resources ensuring continuity of care. - Limited access to Protocol and history software. 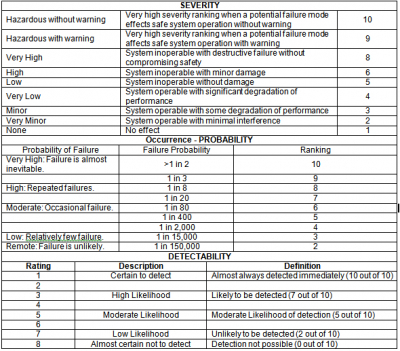 FMEA: Failure Mode effective Analysis. PCEA: Patient Controlled Epidural Analgesia. ADON: Assistant Director Of Nursing. - PCEA policy – ZH Portal > Policies> ASC. - Forms- ZH Portal > Forms > Doctors > Epidural analgesia prescription form > Consent form. - ZH Portal > Forms > Nurses > Epidural analgesia monitoring Record. - PCEA pump Do’s and Don’t. - Epidural Analgesia Patient Feedback Form. 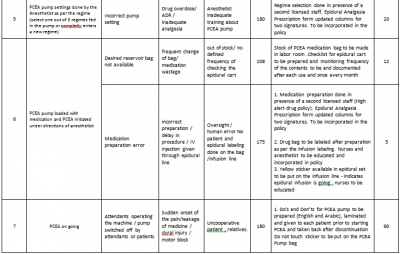 - Epidural Analgesia Cart Checklist.